Stoke Gifford WI was formed in November 1966 and average a membership of 30+. We meet at 7.30pm on the first Wednesday of each month at The Trust Hall, North Road, Stoke Gifford, BS34 8PF. Visitors are always welcome and can attend 2 meetings free. We are very friendly and provide members with interesting activities and social contact. 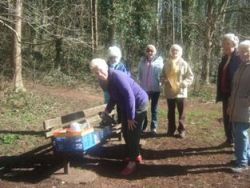 Walks normally take place on the first Monday after our monthly meeting at 10.00am.